I’m trying to forget that horrible Monday night football game between the Bungals and Steelers, but it was actually the moment that changed things for me here in Salinas, Ecuador. 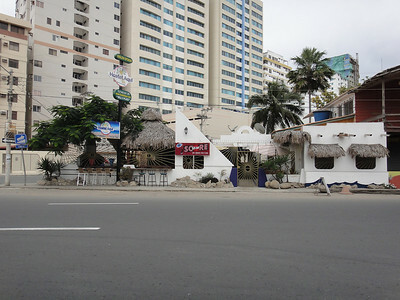 Dusty and I showed up to watch the game at the only gringo hang out in town, Score Bar at Hostal Aqui. We grabbed some seats which happened to be right next to two Steelers Fans, ick. They had enough of their winning ways and left early leaving the seats wide open for the owner of Score Bar to perch on when he arrived. Turns out William is from Lexington, Kentucky and is trying really hard to be a Bengals fan, too. We all spent the night ripping apart our favorite team. Apparently I made an impression because he turned to me and said, “Hey, you want a job?” My immediate response was, “Sure!” I showed up a couple days later to begin my first stint as a bartender. I have never bartended before. I’ve served ice cream, been a receptionist at a lumber yard, coached gymnastics, been a bank teller, worked retail in the mall, designed wedding invitations and flipped houses. Why not add bartending to the mix. I was sure to mention to William that I had no idea how to make a drink but I could pour a mean beer. He instructed me to either ask the people how to make the drink or google it. If I still couldn’t do it, tell them to order something else. Fair enough! I was also given the run down, during the Bengals game and before my first night of work, about how the place had been robbed, twice. He was really selling this job opportunity, wasn’t he? Hostal Aqui now has the decorative gate around it with the only entry point at one door which I would be in charge of buzzing people in and out of. I had all the power. All of this talk about robberies was making Dusty uneasy, but I felt comfortable that everyone had my back and I, of course, had all the power. William instructed that if I didn’t feel comfortable with whoever was at the gate, I should tell them to go away. I liked his attitude. All of these instructions were about to be put to the test on just my second day of working. Myself, another staff member and one guest received some unwelcome guests about a half hour after William left. About thirty people showed up at the door all at once. The group included 3 police vehicles with about 4 or 5 people in each and about 15 people on foot. I sent the staff member to the door to speak to them in Spanish while I waited to see what they wanted. After figuring out that they didn’t want to eat or drink anything (thank goodness because my newbie bartending skills couldn’t pass that test just yet! ), we decided to try to call William and see what he thought. Unfortunately, I couldn’t find his number. Finally, I went to the gate to talk to them myself when I found out that one of them could speak perfect English. He told me they were inspectors and they were here to inspect the restaurant and hostal. I wasn’t sure if I should trust them as well as the fact that the owner wasn’t here to defend himself if in fact it was a true inspection. So, I did what I was told and said, “I’m sorry, I’m not comfortable with this. You can come back later.” They informed me that they would be leaving me with citations, but I was cool with that. So, the drama was over. I conquered the government officials. William tells everyone that comes into the bar about my telling the 15 inspectors and 15 policeman all to go away. I just reiterate that if they were not going to buy food or drinks then they were not welcome. Since that night, I have worked 3 days a week. 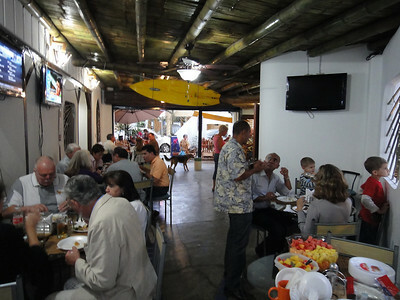 One night included Thanksgiving when we had about 75 guests. Everyone brought a dish for the potluck. 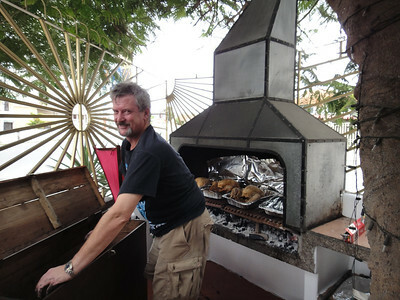 William grilled five turkeys and I worked the bar with a new friend, Cristian, a commercial fishing student here in Ecuador. It was the busiest Score Bar has been during the low season, but I was able to handle all drink requests, thankfully. We had a great time trying everyone’s dishes and fattening our bellies. William’s Ecuadorian cooking and cleaning staff love to ask me questions such as how old I am…that old?…gasp!…. and about my novio or boyfriend…no!… esposo…husband!… gasp! When they inevitably asked when we were going to have babies, it was comical to show and tell them that I was pregnant with a turkey baby. They thought that was hilarious. Now, when we eat the turkey leftovers, they show me their pavo babies. 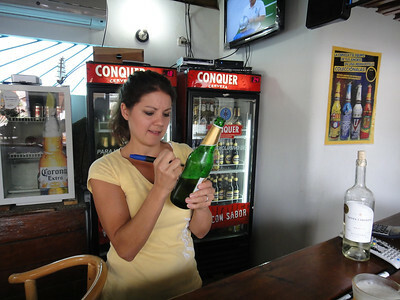 Dusty and I have really enjoyed getting to know everyone that works or frequents Score Bar/Hostal Aqui. It really helped to learn the area and we have made some great friends. As for the bartending gig, I’m not really bringing in the big bucks. I write down my hours and what we eat and drink. William adds it up at the end of the week. My first payday I owed him $8. 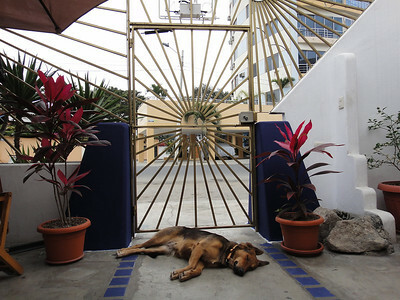 Hostal Aqui has a guard dog named Christmas. You can see she is quite effective. I, of course, rearranged all the bottles of liquor for increased bartender performance and selling opportunities. I can’t help myself. There are about 5 Williams that frequent Score Bar. There are also 2 Wendys here. I am called Wendy #2. WIFI is available to all patrons which is rare in Salinas. I found this place by walking by several times to test the signal strength. William remembers me “stalking” him and thought I was casing the joint. Williams tv’s show NFL, NBA and NCAA games. If it’s not available via satellite, he’ll stream it from his computer if possible. For the OSU v. Michigan game (GO BUCKS!) we listened to the Buckeye radio network while streaming ESPN’s Game Cast on the TV. Whatever it takes.